When Daniel Nava was sent to Pawtucket out of spring training, he accepted his assignment with the knowledge he had made a favorable impression on Red Sox manager Bobby Valentine. “We called him up at the end of spring training and he played really well,’’ Valentine said of Nava, who spent all of last season in Triple A after playing 60 games with Boston in 2010. “Of all the guys that were on the radar, he wasn’t one of them. After hitting .316 with 3 home runs and 17 RBIs in 27 games at Pawtucket, Nava was called up for the start of this four-game series against the Indians Thursday. Nava succeeded in making another favorable impression, going 2 for 2 with a pair of doubles for three RBIs, three runs, and a stolen base in Sunday’s 12-1 romp. 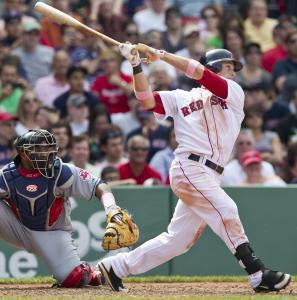 Nava reached on all four plate appearances after twice getting hit by Cleveland righthander Justin Masterson. “He has played a very good brand of baseball,’’ Valentine said. Since his recall, Nava has reached safely in 12 of 16 plate appearances. After spending time with the big club two years ago, Nava said he has a better idea of what to expect the second time around. Darnell McDonald was placed on the disabled list with what Valentine called “a mild right oblique strain,’’ prompting the team to summon first baseman Mauro Gomez from Pawtucket, where he hit .294 and led the team with 10 home runs, 33 RBIs, and 83 total bases. Gomez made his major league debut as a defensive replacement in the eighth for Adrian Gonzalez and struck out swinging in his only at-bat. McDonald said the injury had been nagging him for a few weeks and could not be pinpointed to any particular event, including the inning of relief he threw in a 17-inning setback, 9-6, to the Orioles May 6. To make room for Gomez, the team transferred Jacoby Ellsbury, on the DL since April 14 with a right shoulder subluxation, to the 60-day DL. “His rehabilitation is going right as scheduled, but that schedule wasn’t going to put us in front of 60 days, when you backdate it,’’ Valentine said. Sox owners John Henry and Tom Werner and president Larry Lucchino presented Derek Lowe with a 2004 championship ring before Saturday’s game after his was stolen from his home in Fort Myers, Fla., last week. Lowe, who went 3-0 in the 2004 postseason including wins in clinching games in the ALCS and World Series, amassed 81 saves and went 70-53 with the Red Sox. He’s 5-1 this season. Daisuke Matsuzaka was roughed up in his fourth rehab start at Pawtucket, getting a no-decision in a 7-6 win over Columbus Saturday night at McCoy Stadium. He allowed five runs on seven hits, including a pair of two-run homers, in 5 1/3 innings. Matsuzaka, who threw 90 pitches, also had one walk to go with five strikeouts, giving him 19 over his 18 2/3 innings. “I didn’t think he was as good as he should be, but he was pain free,’’ Valentine said of Matsuzaka, who is expected to make his fifth and final rehab start Thursday in Pawtucket. Dustin Pedroia doubled to center in his fourth at-bat, extending the league’s longest active hitting streak to 14 games with his seventh-inning hit off Dan Wheeler, who was designated for assignment by the Indians after giving up six runs on five hits and one walk in the seventh . . . Johnny Damon seemed to finally get some love from the Fenway Faithful when he received a warm ovation after a video compilation of his heroics in the 2004 postseason was played on the center field scoreboard. Damon emerged from the dugout and doffed his batting helmet. “It’s the first time I ever felt acknowledged as a visitor,’’ said Damon, who was treated as a traitor for signing with the Yankees in 2006 . . . Kevin Youkilis, on the disabled list for a lower back strain, ramped up his baseball activities Sunday, taking grounders at third and some swings in the cage. “That’s another step up,’’ Valentine said . . . Rich Hill, Matt Albers, and Scott Atchison combined to throw three scoreless innings of relief for the Sox, giving Boston’s bullpen a 1.12 ERA in 12 games in May, excluding McDonald’s outing . . . Will Middlebrooks, who went 2 for 3 and hit his fourth homer, now has nine extra-base hits in his first 10 major league games, the most since Cincinnati’s Chris Dickerson had nine in 2008 . . . The Sox had seven extra-base hits, including five doubles, giving them 142 extra-base hits and 100 doubles for the season, both major league highs.